Many times in our lives when the pressures of life burden us, we become very discouraged. Although we know that the Lord is with us, we allow our emotions to rule us in a completely negative way. But the Lord has not designed this life for us to live negatively, but rather in a faith filled confident manner as a son of our Heavenly Father. The Lord has not promised to us a bed of roses in all our ways in this life. But He has promised us, “When you go through deep waters [of trials], I will be with you. When you go through rivers of difficulty, you will not drown. When you walk through the fire of oppression, you will not be burned up; the flames will not consume you.” [NLT](Isaiah 43:2). Why should the Lord be with us and yet not completely stop us from experiencing such hardships? It is because without walking through the realities of life we can never understand what it means for us to walk through the tough times of our lives saying “For the LORD is my confidence, and He will keep my foot from being caught. “ [Personalized](Proverbs 3:26). This walk of confidence with one’s head held high all the time is a warrior’s walk of faith. It cannot be taught but it can only be walked. Have you ever found a person honored as a warrior who has not even once fought a battle? It cannot be. A warrior is basically a soldier, usually one who has both experience and skill in fighting, especially in the past. They have a life style of victoriously fighting and winning all through their lives. We are trained to be warriors in this present life, so that we can live eternally with our God as His honored sons in the new heaven and new earth which He has prepared for all of us in the future. Cowards will not be allowed in to His eternal property which He has planned before the foundations of the world (Rev 21:7-8, Heb 4:3). We are the children of a God who Himself says “I am a warrior; Yahweh [i.e. Jehovah – the Lord] is My name!” [Paraphrased](Exodus 15:3). Now do you understand why we face all the trials and tribulations in this life? It is because our Heavenly Father wants to inculcate His warrior nature in to us. Praise the Lord! We as God’s children do not lack anything to become successful in this life. This is the reason King David said “The Lord is my shepherd; I have all that I need.” [NLT] (Psalms 23:1). We already have all the necessary equipments [i.e. promises of God] with us to be highly successful warriors in this life. The instruction manual for warriors assures us that, “All Scripture is inspired by God and is useful for teaching, for showing people what is wrong in their lives, for correcting faults, and for teaching how to live right. Using the Scriptures, the person who serves God will be capable [equipped and be lethal to cause carnage against Satan and his evil minions], having all that is needed to do every good work.” [NCV] (2 Tim 3:16-17). We become a capable and equipped warrior against evil when we are filled with the ammunition of Scriptures. Without the Scriptures in our heart we become powerless against the enemy of our souls [i.e. Satan and His cohorts] and cannot serve God effectively by doing the good works of God as his dear children on earth. Jesus as a perfect man like one of us was full of scripture, which is the reason He was able to destroy the works of the devil (1 Tim 2:5; 1 John 3:8; Matt 4:4, 7, 10). All we need to do with the Scriptures is to meditate on it all the time which will help us be successful in our lives. The Lord told Joshua, “8 This Book of the Law shall not depart from your mouth, but you shall meditate in it day and night, that you may observe to do according to all that is written in it. For then you will make your way prosperous, and then you will have good success. 9 Have I not commanded you? Be strong and of good courage; do not be afraid, nor be dismayed, for the LORD your God is with you wherever you go.” (Joshua 1:8-9). In the preceding verse we see Joshua the courageous warrior was instructed by the Lord to speak the word of God to encourage himself, meditate the word of God to have a winning attitude and observe [i.e. practice] the word of God to see God’s triumphant power manifested in his life. After this God did not say to Joshua, ‘…then I will make your way prosperous and I will give you good success.’ But God said, “For then you will make your way prosperous, and then you will have good success.” In other words God was saying to Joshua, ‘When you speak the word of God through your mouth, meditate it in your mind and practice it in your life….you will automatically enroll yourself as a success story because of your positive attitude as a warrior in your life’. What does it teach us? It clearly teaches us that the word of God has the potential within it to make us highly prosperous and empower us to self-script a great success story in our lives. In other words, whether you are a real success or a failure depends on how you use the scripture that God has given you to live by. 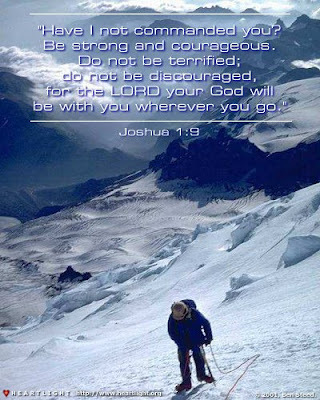 Then the Lord commanded Joshua to be strong and courageous. To be strong and courageous is a good choice which will allow God’s faith and goodness to influence us and will make us trust God towards the target of victory. This is God’s warrior nature which triumphs always. To be afraid and dismayed [saddened, troubled, disappointed and distressed] is a bad choice which allows Satan’s nature of fear and evil to influence us and separate us from God. God has guaranteed to Joshua the warrior and to us His warrior sons that no matter what the circumstances you go through, “….I the Lord your God is with you wherever you go”. O What a promise! Confess now, ‘The Lord my God is with me wherever I go’. Say it at least three times! The reality of the word of God lived in our lives will bring the presence and assurance of God in perpetual manifestation, which is the secret behind every successful and prosperous person who made this life count for eternity. God’s attitude is a winning attitude. Winning is not a onetime event, rather it is an attitude of our mind which propels us in to a higher altitude of faith and success as we learn to live in it all the time. Say for example a man may win on a particular day and as a result he may feel very happy to rest on the laurels he received on that day. But as he goes home, he slowly begins to realize that something has gone wrong on that day which was not in his control altogether. Suddenly without a second thought he becomes angry and upset with his whole family. The happiness this man had felt until then suddenly turns in to gloominess, and as a result of it the whole family gets affected because of his tantrums. What we see is a classical example of a loser whose attitude towards life is based on events happening at that particular time. If that person is able to handle it maturely by not giving in to anger and fear of what has happened, but rather if he has rather dealt those problems as an opportunity for God to intervene and correct it based on his unshakeable faith in the word of God which says, “And we know that all things work together for good to those who love God, to those who are the called according to His purpose.” (Rom 8:28). This man would have prospered in that particular situation and he would have successfully dealt those problems. Instead of reacting in unbelief, he would have acted in faith. Faith always will bring the presence of God to be involved in our lives and situation. Faith is a winning attitude of our mind which will attract God to intervene and bless us every time we face problems in our lives. The winning attitude will always think in terms of what God can do in our lives rather than what we can achieve with our own limited ideas and strength. The winning attitude has no boundary to contain its enthusiasm because it is as big as God Himself. The winning attitude will make a person to confess positively like Apostle Paul who said, “I can do all things through Christ [the Anointed one] who strengthens me.” (Phil 4:13). These confessions will saturate the atmosphere where we are with the Heavenly Presence of God which will spread very contagiously to others who are around us. Thus we will be fulfilling our destiny “…on earth as it is in heaven.” (Matt 6:10). The winning attitude is a warrior’s attitude which will make us as bold as a lions because we are essentially of the ‘the winning tribe of the lion of Judah’ (Gen 49:8-11; Rev 5:5). Judah means ‘praise or proclaimers of God’s praise’. We as the children of God should learn to praise God always. Praise is a royal robe that we wear by receiving it from God (Isaiah 61:3). Praise is highly positive and it aligns our life in the exact psyche of the winning attitude where we will live life abundantly at our best. Praise releases the goodness of God in to our spirit, soul and body. So only David after experiencing the goodness of God said, “Praise the LORD! For [it is] good to sing praises to our God; For [it is] pleasant, [and] praise is beautiful.” (Psalm 147:1). David had no more words left to describe the benefits of praise, so he finally said “…praise is beautiful” as though he could see praise as a tangible image. In fact he is right because God dwells and manifests physically when His people praise Him (Psalm 22:3). Inculcate the winning attitude of praising God all the time to become a mature son of God. Praise the Lord. We cannot experience the consciousness of God’s presence to the full in a single day. It takes day after day, and year after year of obedience to the voice and the word of God to maturely dwell continuously in the presence of God. But it is easy to attain once we set our sight on it because God’s original desire for every human was to fill every man to such an extent that they will be more conscious of God’s presence than the clothing that they wear to cover their nakedness, which is nothing but the consciousness of one’s self in contrast to God consciousness. Adam and Eve were covered by the glory of God initially before the fall of man, so only they never felt that they were naked until Satan took control of the soulish realm of humans (Gen 3:8). When Adam confessed to the Lord that when he heard His voice, he was afraid because of his own nakedness and hid himself, the first question that God asked Adam was, “Who told you that you were naked?..” In other words God was saying, why have you started to believe all that the devil has been telling you. Even in our times if we keep listening to the voice of God daily in our Soul constantly we will lose consciousness of our self and will start to focus on God’s greatness and his love towards us which we were created for, so that we will start to enjoy every moment of our lives on earth. The Glory of God is the tangible weightiness of God’s presence. If you desire to be clothed by it in our generation with an intense desire for it as in the beginning of creation the Lord will clothe you too. Glory of God is the physical and visible manifestation of the Spiritual presence that God chooses to reveal to us. 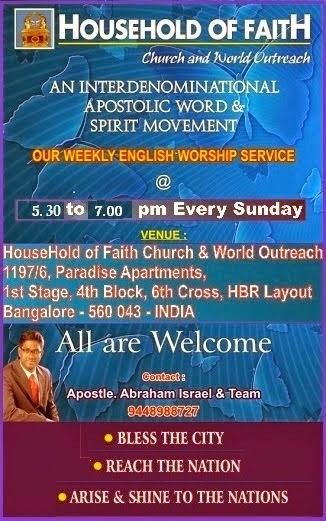 The Bible shows how God by His presence fellowshipped with Adam and Eve in Gen 3:8-10 which says, “8 And they [i.e. 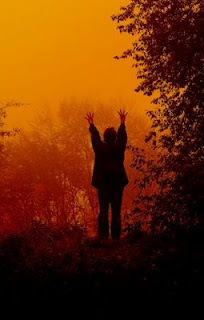 Adam and Eve] heard the sound of the LORD God walking in the garden in the cool of the day, and Adam and his wife hid themselves from the presence of the LORD God among the trees of the garden. 9 Then the LORD God called to Adam and said to him, “Where are you?” 10 So he said, “I heard Your voice in the garden, and I was afraid because I was naked; and I hid myself.”” From the preceding verses we can understand that the presence of the Lord God once focused will make us hear the sound of the Lord God in this earth. When the Lord God called Adam, he responded saying that he heard his voice and was afraid and hid himself, because negative emotions took over him from the devil which Adam was not able to realize at that point of time because of the fallen nature. Still the modus operandi [i.e. a particular way of doing something] of the devil have not changed a single bit. When a person starts to desire for the presence of God, Satan will immediately start to stir all the negative emotions in his soul to make that person afraid. If we desire to really feel the presence of God daily we need to discipline ourselves to pray continuously no matter what kind of feeling Satan stirs in our heart. This kind of persistent prayers sometimes will suddenly usher us in to God’s presence or else God may choose to manifest later. But know one thing the Lord will be watching your intense desire and will slowly start to bless you with his tangible presence which will get deposited in you and will be with you for eternity. By the way tongues are one of the main ways of communicating to God persistently according to His will. If you have not yet received it, believe that the Lord’s will for you is to speak in tongues and then by faith speak it out (Mark 16:17). God will give you the utterance from your spirit man. Tongues are one of the best ways to renew and edify your mind. It is one of the greatest weapons in the weaponry of the warrior. It is exclusive only to those who long to feel the consciousness of God’s presence all the time. Speaking in tongues is like a sweet music that you listen to soothe your soul when distressed by the burdens of life. Joy will swell from the depth of your soul because God will be very pleased that you are speaking to Him exactly His will to get fulfilled through your life. It will edify your soul and bring the consciousness of God’s presence (1 Cor 14:4). One of the greatest mystery questions to many is ‘Why I do not feel God all the time?’. At the same time one of the greatest truth to remind ourselves and confess is, “The Lord will never leave me nor forsake me” [Personalized] (Heb 13:5). God can choose to withdraw his tangible presence from us in order to test us so that He might know how we will react when we consciously do not feel the nearness of His tangible presence (2 Chron 32:31). The word of God says that God tests the hearts of men, has pleasure in uprightness and rewards every man according to the results of the doings of the thinking of man (1 Chron 29:17). This does not mean that He has left us. One thing we must understand is that we cannot run away from the long arm of the Lord. King David understood the awesomeness of the omnipresent nature of God in his life because God revealed Himself in that dimension to him. So only David said in Psalm 139:7-10, “7 Where can I go from Your Spirit? Or where can I flee from Your presence? 8 If I ascend into heaven, You are there; If I make my bed in hell, behold, You are there. 9 If I take the wings of the morning, and dwell in the uttermost parts of the sea, 10 Even there Your hand shall lead me, and Your right hand shall hold me.” From this preceding verse we can clearly understand that the presence of God is the Spirit of God. He is present everywhere, in heaven and also in hell. In heaven He chooses to manifest the glory of His presence. In hell He chooses to withdraw His presence from those who are present there. Don’t think that it is just the fire and worms that torment people in hell, but it is the lack of the manifestation of the presence of God and His goodness that will torment people in hell (2 Thess 1:9; Rev 22:15; Matt 25:41, 46; Mark 9:44). A person can be in midst of fire yet be more confident and joyful than any other person in the universe if he has the presence of God and His glory over him. This was literally proved by the three friends of Daniel named Shadrach, Meshach and Abednego who enjoyed their adventurous journey in to the fire because Jesus the fourth man was standing with them pouring His glory anointing all over their bodies so that not even one hair in their bodies got burned due to the ravaging fire (Daniel 3:23-25). But the fact is, He is present in all the places and there is not a single inch in the universe where He is not present in person (Jer 23:24). Many times in our lives we do not feel the nearness of God when going through very tough situations. We feel as though God has left us and we are left alone to defend for ourselves. But the fact is those are the times, when God carries us in His arms. God says in Isaiah 46:4, “Even to your old age, I am He, and even to gray hairs I will carry you! I have made, and I will bear; even I will carry, and will deliver you.” In other words God is saying, I am the God who carries you now, I do not change, when you become old and strength less with grey hairs, My nature to carry and deliver you from difficulties will never change. What a great comfort to know the loving character of our Lord and to rest in the assurance that “…God is faithful, who will not allow us to be tempted beyond what we are able, but with the temptation will also make the way of escape, that we will be able to bear it.” (1 Cor 10:13). The way of escape is the time after we take a quality decision to stand with Him, when His power becomes strong in our weakness (2 Cor 12:9-10). These will be the times in which the Lord will literally carry us and comfort us through His Spirit (2 Cor 1:3-4; Acts 9:31). When we fail to stand with Him and take a quality decision, we will not be able to feel the tangible presence of God after our failure. But you know, we can escape from those times of loneliness by immediately and boldly approaching the throne of grace by confessing our wrong doings, so that we can align ourselves again right in the midst of God’s favor (Heb 4:14-16; 1 John 1:9). The moment you approach the throne of grace, don’t say to God, ‘Please forgive me and start to cry day after day, begging for forgiveness as though God is not ready to forgive you and angry enough to tear you to pieces.’ If you are doing such things, know that the devil has deceived you to live in unbelief because of your lack of knowledge about God and His word (Hosea 4:6). 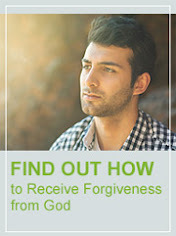 The word of God says, “The moment we confess our mistakes and sins, He is faithful and just enough to forgive us and cleanse us from all unrighteousness” [Paraphrased] (1 John 1:9). Your confession for your sins must be faith-filled like the following confession statement, ‘Lord I am sorry for doing this thing that you don’t like. Thank you for forgiving me and cleansing me by being just and faithful, help me overcome this problem the next time, in Jesus name, Amen.’ Remember, God forgives us not because we ask Him sorry but because He is faithful and just to keep His covenant that He had made with Jesus. This new covenant of forgiveness is active and powerful for all those who come to God through Jesus, by faith in the cleansing power of the shed blood of Jesus (Heb 10:15-18; 9:22, 14). We have a failure proof exit of escape from Satan’s condemnation and his lawlessness because of God’s overcoming, forgiving and cleansing power which is available freely and perpetually to us (Rom 8:1). The following parable will give you more understanding about the invisible footprints of God in our lives which we are not able to see tangibly daily. I believe that this parable will edify us with the eternal truth that ‘God carries us now and then perpetually in our lives because of His love towards us as His beloved children. Because of the fallen nature of the world, we “will have tribulation” as long as we live in this world (John 16:33). But be joyful and of good cheer, for our Jesus has already won the battle against all the satanic depressive and destructive influences of the world! He will carry you in all your trials and tribulations as He has promised faithfully! 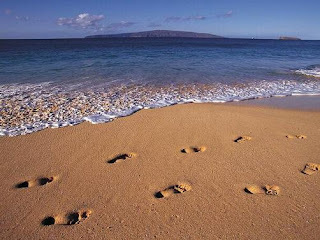 When the last scene of his life flashed before him, he looked back at the footprints in the sand. He noticed that many times along the path of his life there was only one set of footprints. He also noticed that it had happened at the very lowest and saddest times in his life. When you go through harsh times of trials and hardships in your life, always remember the invisible footprints that have profound meaning to it. If you can see with the eyes and understanding of God you will begin to thank and praise the Lord through all your trials joyfully. This is the reason Apostle James said, "My brethren, count it all joy when you fall into various trials, 3 knowing that the testing of your faith produces patience. 4 But let patience have its perfect work, that you may be perfect and complete, lacking nothing.” (James 1:2-4). When God’s presence is with you in its fullness you will lack nothing! Without going through the trials you cannot receive this completeness of peace and prosperity in your life. Pray with me now, ‘Thank you Lord for all the trials, tribulations and hardships that I go through in my life because you are with me, carry me and will deliver me from all these temporal things, which you are working together for my good. Thank you for giving me all that I need in order to be successful. Help me live daily in your presence, expressing the warrior character of you in my life. Help me meditate on your word always and live my life with a winning attitude, by being conscious of your living presence within me always. Help me see my life with your eyes and understanding, seeing it with an eternal perspective. Thank you for your promises and your guidance in my life. Thank you for making me successful through your empowerment in my life. In Jesus name I pray, Amen and Amen….’ Praise the Lord!